In My Kitchen, brought to Vancouver by local Vancouverite Paula Mohammed who was brought up in, and influenced by, an array of diverse cultures, invites diners to learn diverse recipes and explore traditional cooking techniques right in the host cooks&apos; homes. Then, guests bask in the fruits of their efforts when they dig into a shared meal in a unique Vancouver home and neighbourhood. For Mohammed, this bespoke dining experience acts as a point of shared connection and cultures through delicious, homemade fare. This unique 4.5-hour culinary experience begins at 4 p.m., where guests enjoy a light snack and warm welcome from the host, before donning an apron in the kitchen. The evening will include new cooking techniques and culinary history, a chance to relax over food, stories, and excellent company at the end of the night, and a list of recipes so diners can recreate dishes at home. This summer join Céline in Vancouver&apos;s Commercial Drive neighbourhood and explore Farm to Table Swiss Family Favourites like pan-roasted local venison with a Pinot Noir and porcini mushroom reduction sauce and a mouthwatering apple, amaretti custard and cream dessert straight from Céline&apos;s step-mother, Heidi. Explore Japanese flavours with savoury Yakitori, grilled vegetables, and sweet mochi parfaits for dessert in Naomi&apos;s Mount Pleasant neighbourhood kitchen. Tuck into a traditional Middle Eastern family meal in Suha&apos;s home in Surrey, Metro Vancouver. Straight from her family&apos;s recipe books, learn how to make aromatic comfort food like baba ghanoush with delicious roasted eggplant and tahini dip and a scrumptious Lebanese semolina and coconut cake drizzled with rosewater sugar syrup. And join Luise, who divides her time between Spain and Vancouver, in her kitchen in the scenic Point Grey neighbourhood and take a culinary road trip with seafood paella, tomato Salmorejo, and Crema Catalana (a Spanish Creme brûlée). Hungry? 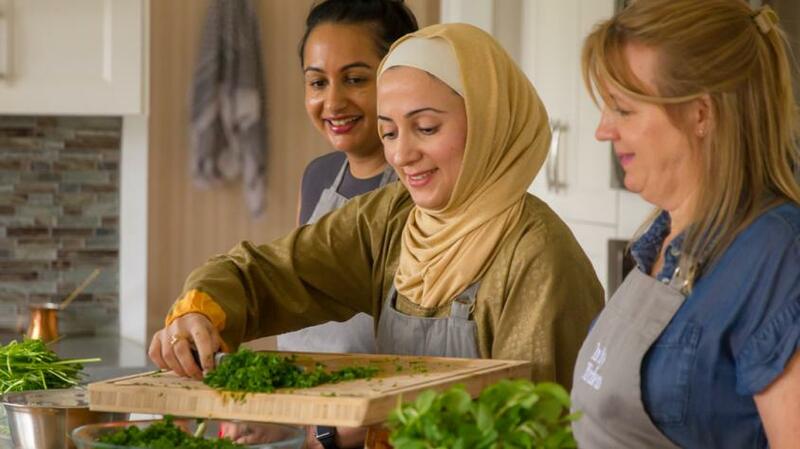 Learn more about these unique culinary experiences and their hosts on the In My Kitchen website, and prepare to be inspired in the kitchen by these passionate home cooks. Each evening serves six guests and tickets are $125 each.